Above: Flooding on Easy Pressy Road off Highway 21 in Nebraska on March 14, 2019. 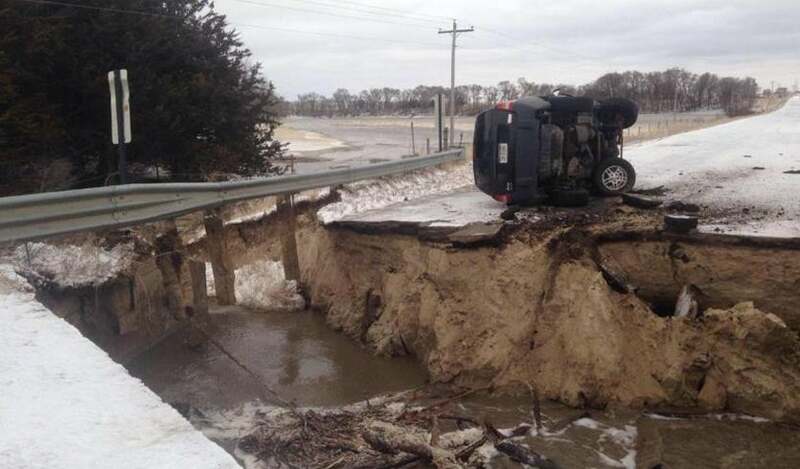 Image credit: NSP Troop D.
All-time record flooding is occurring in Nebraska, Iowa, South Dakota, Wisconsin, and Minnesota in the wake of heavy rains and snow melt from this week’s bomb cyclone. The storm swept through the central U.S. on Wednesday and Thursday, bringing heavy rains of 1 – 3” over a large swath of northeast Nebraska, northwest Iowa, and southeast South Dakota. These heavy rains fell on a snowpack with a high liquid water content, and the resulting runoff brought all-time high-water marks to at least 24 river gauges in five states, with several more likely to reach all-time crests by early next week. 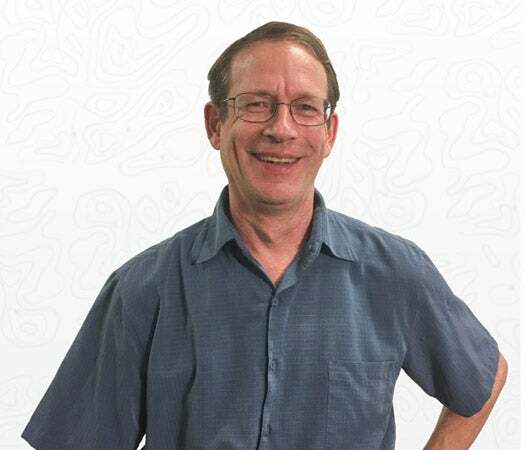 One death has been blamed on the floods--an unidentified Nebraska farmer who was killed Thursday after the tractor he was using to try and save a stranded motorist was carried away by floodwaters on Shell Creek near Columbus, in eastern Nebraska, the Omaha World-Herald reported. Figure 1. Locations of the 24 all-time river flood crests observed as of 1 pm EDT Friday, March 15, 2019. Nebraska has seen the most intense and widespread flooding. The floods have caused one dam to fail and threaten to breach another. The Spencer Dam on the Niobrara River in northeast Nebraska failed around 5 am Thursday, prompting the evacuation of dozens of residents. Floodwaters from the breach washed away a bridge on Highway 281 over the Niobrara River south of the dam. In addition, the Ericson Dam in north-central Nebraska was at high risk of failing on Friday afternoon as the Cedar River continued to rise. On Friday morning, all-time record flooding on Nebraska’s Platte River caused a levee failure, forcing the evacuation of the National Weather Service office for Omaha, Nebraska. Their weather radar has been shut down and will not transmit data for the duration of the flood. Upstream from them, the Platte River has sent flood waters into the town of North Bend (population 1200). Figure 2. River stage of the Platte River near the National Weather Service (NWS) office in Omaha, Nebraska. The river crested at its highest level on record, beating the mark set in 1996 by nearly a foot. The NWS office was forced to close due to the flooding. 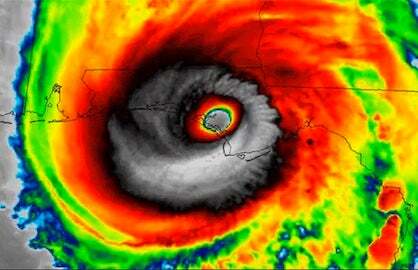 Image credit: NWS. A third of the 24,000 residents in Norfolk, Nebraska, were ordered to evacuate Thursday after the Elkhorn River reached a record crest and the city's levee system "neared its top," city officials said. One person was reported missing after their car was swept away, News Channel Nebraska reported. The flooding caused a bridge collapse on Highway 13. 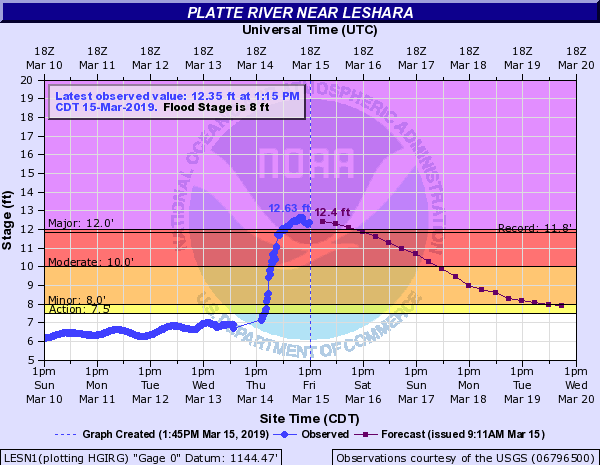 Record flooding is occurring on America’s longest river, the Missouri River, at two locations in Nebraska: Plattsmouth and Nebraska City. The crests on Saturday are predicted to be over a foot above the records set in 2011 at the two cities. According to the NWS, the 2019 flood exceeds the 1-in-100-year flood for the Nebraska City gauge; the water would have to rise an additional 1.5’ to be considered a 1-in-500-year flood. The predicted flood crest of the Missouri River at Decatur on Sunday will also exceed the 1-in-100-year threshold. The Cooper Nuclear Station lies just downstream of Nebraska City, and the nuclear power plant is expected to close this weekend due to high flood waters on the Missouri River. The plant was able to stay open during the record 2011 flood, so this may be the first time the plant is closed for flooding. Downstream, at Atchison, Kansas, the Missouri River is predicted to crest early next week at its highest level on record, beating the mark set in the great flood of 1993. At the predicted flood crest, the levees on the Missouri side of the river will overtop in multiple locations, flooding a large stretch of the river’s flood plain. Figure 3. 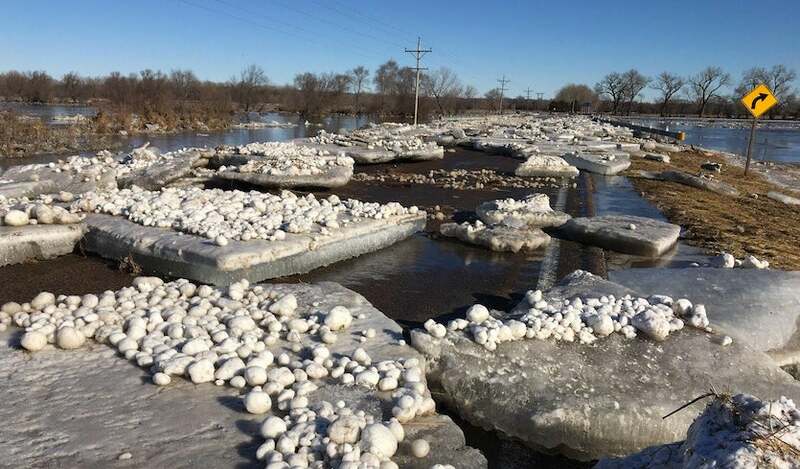 Ice jam flooding on Highway 14 south of Fullerton, Nebraska on March 15, 2019. Image credit: Nebraska State Patrol. 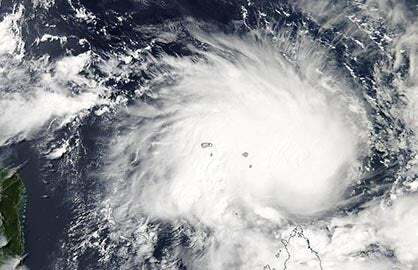 The record flooding was due to an unusual set of meteorological conditions, as explained in detail at weather.com. The heavy rains from the bomb cyclone were accompanied by very warm temperatures which melted a snowpack of 5 - 13” of snow. The snowpack had a high liquid water content--equivalent to an extra 1 – 3” of rain falling--since the snow had been accumulating and compacting since early February. When Wednesday’s warm temperatures in the 50s and 60s and heavy rain melted the snow, the runoff flowed very quickly into the rivers, because the frozen ground was unable to absorb much water to slow things down. Many of the flooding rivers had thick ice covering them, due to the long stretch of cold weather the Midwest endured this winter. When the huge pulse of floodwaters entered the rivers, this caused the ice to break up and create ice jams, which blocked the flow of the rivers, causing additional flooding. 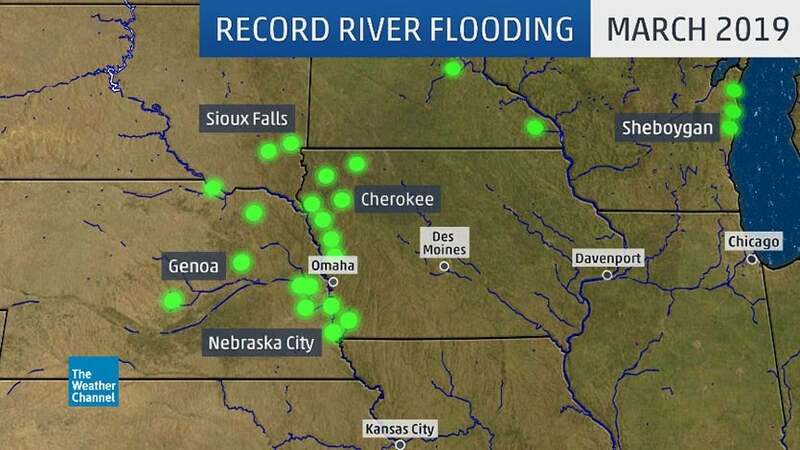 In addition to the Nebraska and Missouri River flooding discussed here, record flooding has also hit Iowa, South Dakota, Wisconsin, and Minnesota. Weather.com has a full round-up of the flooding here. Fortunately, mainly dry weather is expected in the flood region during the coming week, with less than a quarter inch of precipitation forecast. However, a major warm-up is coming by the middle of next week, which will accelerate melting of lingering snow cover from the northern Plains into the northern Great Lakes, keeping rivers relatively high through the end of March.